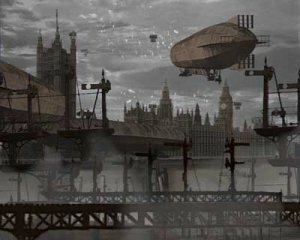 The first TRUE steampunk film in 1884: YESTERDAY'S FUTURE? Our friends over at Opium have discovered what looks to be the first feature length steampunk film. Truly victorian and set in 1884, it's a mixture of animation, puppetry, and 2d and 3d cgi against mattes, models and period photographs. Wow, that sounds like a tall order, but if you've ever seen the likes of Osbert Parker's mixed media short films, then you know how cool this could be. We don't have very many details but we know it's going to be a comedy so check out the details below and we have a promo trailer after the break which looks quite rough, but I'm sure they're going to make this look spectacular. A story of outstanding heroism in the face of deception, subterfuge and treachery. Conjuring up the belief that it was made forty years before film was even invented, 1884: Yesterday's Future tells of a future that might have been but never was. Directed by Tim Ollive, the film is a mix of animation, puppetry and two dimensional and three dimensional computer generated imagery (CGI) set against backgrounds created using stunning artwork, model sets and period photographs from the Hulton Picture Library division of Getty Images. Combine these idiosyncratic production techniques with a script of mind boggling ingenuity and you have a hilarious comedy film the like of which you will not have seen before. Promo trailer after the break. "first feature length steampunk film"?